Signed "Viking" with the latest patent in 1908, this set of four stacking "lawyer's" bookcases are from the Arts and Crafts period. 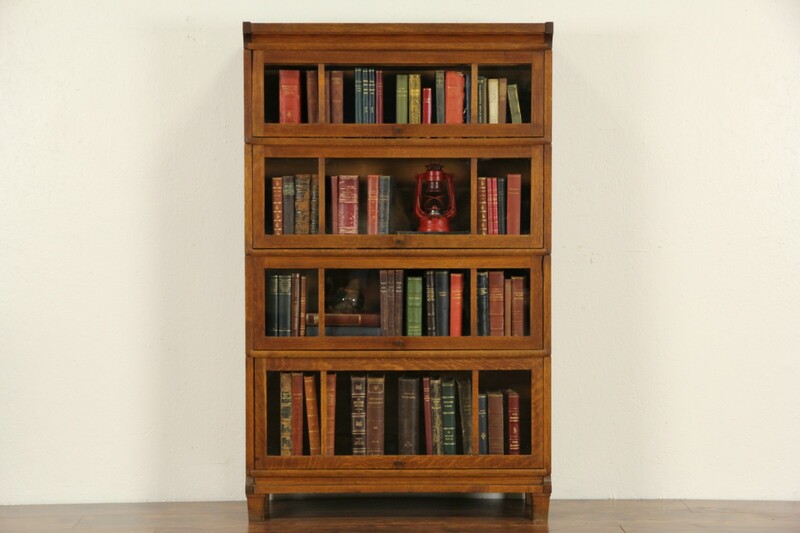 All original, this solid oak library or office Craftsman furniture has wavy glass panes. The finish is worn just enough for a little antique character, there is a plant ring on top, see photos. Waxed and buffed, all that is needed to maintain the warm patina is an occasional wipe with a soft dry cloth. The base and top are also separate stacking sections. Graduated sections fit books up to 10" wide, and 8 1/2," 9 1/2," 10 1/2," and 11 1/2" tall respectively. Overall dimensions are 34" wide, 12" deep and 55 1/2" tall.